Most of my works (over 70) are available online. Either you could check them on Google Scholar Citations (link), DBLP (link) as well as over at arXiv (link). 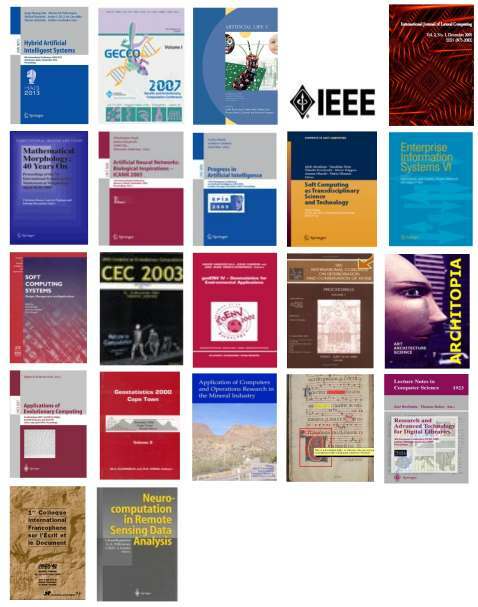 On arXiv all of them are available on PDF format as pre-prints. Direct PDF links to arXiv are also available below for each work. A list of top cited papers is available from here. 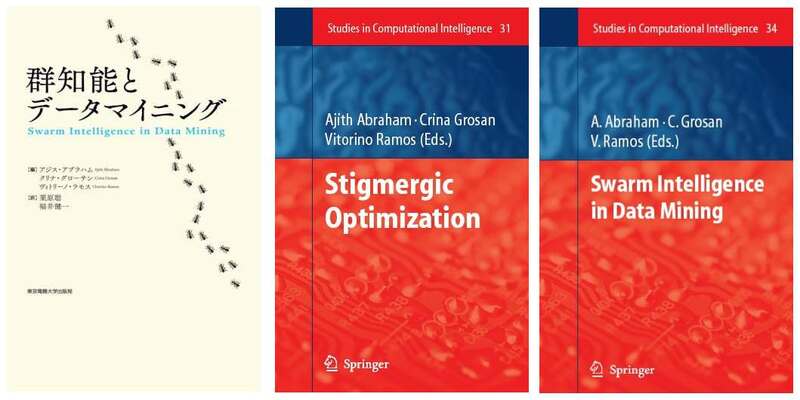 群知能と データマイニング, “Swarm Intelligence in Data Mining”, Ajith Abraham, Crina Grosan, Vitorino Ramos (Eds. ), Tokyo Denki University press [TDU], Tokyo, Japan, July 2012. 49. Carlos Figueiredo, Luis Aires-Barros, Paula Figueiredo, Pedro Pina and Vitorino Ramos, Statistical and Morpho-Structural Image Analysis: A Useful Tool for Stone Damage Evaluation, in STONE´2004, Kwiatkowski, D. & Löfvendahl, R. (Eds.) – Proceedings of the 10th International Congress on Deterioration and Conservation of Stone, 27 June – 2 July 2004, Stockholm, Vol. II, pp. 635-642, ICOMOS Press, Sweden. 46. C. Figueiredo, P. Pina, P. Figueiredo, L. A.-Barros, V. Ramos, P. Machaqueiro, Texture Analysis of Images taken from Artificially Aged Stones: A Statistical and Structural Approach, in MONUBASIN´04 – 6th International Symposium on the Conservation of Monuments in the Mediterranean Basin, Lisbon, pp. 248-252, 7-10 April 2004. 44. C. Figueiredo, P. Pina, P. Figueiredo, L. A.-Barros, V. Ramos, P. Machaqueiro, Análise de Imagem de Rochas Alteradas Artificialmente – Uma Abordagem Estatística e Estrutural, Actas do VI Congresso Nacional de Geologia (Edição em CD-Rom), 4 pp., Faculdade de Ciências e Tecnologia, Univ. Nova de Lisboa, Costa da Caparica, 4-6 Junho 2003. 43. C. Figueiredo, P. Pina, P. Figueiredo, L. Aires-Barros, V. Ramos, P. Machaqueiro, Análise de Imagens de Rochas Alteradas Artificialmente: Uma Abordagem Estatística e Estrutural, Jornal Ciências da Terra (UNL), Volume especial V, 25, Faculdade de Ciências e Tecnologia, Univ. Nova de Lisboa, 2003. 40. Stefano Bonduà, Vitorino Ramos, Evolution, Neoteny, and Semi-Variogram Model Fitting Search, in Sanchez-Vila, Xavier; Carrera, Jesus; Gómez-Hernández, Jaime (Eds. ), Kluwer, Vol. 13, ISBN: 1-4020- 2114-3, pp.500-502, GeoENV´2002 – Fourth European Conference on GeoStatistics for Environmental Applications, Nov. 27-29, 2002, Barcelona, Spain. 38. M.H. Simões, M. Caetano, V. Ramos, J. Almeida, Darwinismo Sináptico e Geostatística em Modelação Espacial da Biodiversidade, in ESIG´2002 – VII Encontro de Utilizadores de Sistemas de Informação Geográfica, USIG, Tagus Park, Oeiras, 13-15 de Novembro 2002. 34. Vitorino Ramos, Artificial Neoteny in Evolutionary Image Segmentation, Proc. of SIARP´2000 – 5th IberoAmerican Symposium on Pattern Recognition, Fernando Muge, Moisés Piedade & R. Caldas Pinto (Eds. ), ISBN 972-97711-1-1, pp. 69-78, Lisbon, Portugal, 11-13 Sep. 2000. 30. F. Muge, I. Granado, M. Mengucci, P. Pina, V. Ramos, N. Sirakov, J.R. Caldas Pinto, A. Marcolino, Mário Ramalho, P. Vieira, A. Maia do Amaral, Automatic Feature Extraction and Recognition for Digital Access of Books of the Renaissance, Proc. of ECDL’´000 – 4th European Conference on Research and Advanced Technology for Digital Libraries, J. Borbinha and T. Baker (Eds. ), ISBN 3-540-41023-6, Lecture Notes in Computer Science, Vol. 1923, pp. 1-13, Springer-Verlag -Heidelberg, Lisbon, Portugal, 18-20 Sep. 2000. 28. Richard Bouché, Hubert Emptoz, …Vitorino Ramos, et al, DEBORA: Digital AccEss to BOoks of the RenAissance – Projet Européen NLB 5608 A, brochure presented at CIFED´2000 – 2éme Colloque Internacional Francophone sur l’écrit et le Document, (special session) related with DEBORA project, 157 pages, Lyon, France, June 2000. 25. Vitorino Ramos, Fernando Muge; On Image Filtering, Noise and Morphological Size Intensity Diagrams, RecPad´2000 – 11th Portuguese Conference on Pattern Recognition, in Aurélio C. Campilho and A.M. Mendonça (Eds. ), ISBN 972-96883-2-5, pp. 483-491, Porto, Portugal, May 11-12, 2000. 24. Pedro Pina, Vitorino Ramos, Fernando Muge; Stochastic Geometry Simulation using Granulometrical Features, in Kleingeld W.J. & Krige D. (Eds. ), GEOSTAT´2000 – 6th International Congress on GeoStatistics, 10-14 April 2000, volume 2, pp. 912-921, Geostatistical Association of Southern Africa, Cape Town, South Africa. 23. Muge, F.; Pina, P.; Ramos, V.; Mengucci, L. Sottomayor; O Projecto COSS – Um caso de sucesso na aplicação de novas tecnologias para a caracterização e classificação automáticas do aspecto visual de produtos transformados de rochas ornamentais naturais, Revista A Pedra, Lisboa, Janeiro 2000. 22. F.Muge, V.Ramos, P.Pina, M.Mengucci; Automatic Characterisation and Classification of Granite Slabs, APCOM´99, Computer Applications in the Minerals Industries, 28th Intern. Symposium, Kadri Dagdelen (Eds. ), pp. 77-84, ISBN 0-918062-12-8, Colorado School of Mines, Colorado – USA, Oct. 20-22, 1999. 20. Vitorino Ramos, Pedro Pina, Fernando Muge; COSS Project (Characterisation of Ornamental Standard Stones by Image Analysis of Slab Surface), SNRFAI´99 – VIII Simposium Nacional de Reconocimiento de Formas y Análisis de Imágenes, M.I.Torres et A.Sanfeliu (Eds. ), ISBN 84-95120-82-8, Vol. 2, pp. 69-70, Bilbao, Spain, May 1999. 19. R.Bruno, S.Persi Paoli, P. Laurange, F.Muge, P.Pina, V.Ramos, M. Chica-Olmo,E.Serrano, A Global Approach to Visual Characterisation of Ornamental Stone Standards, GEOVISION´99 – International Symposium on Imaging Applications in Geology, pp. 29-32, Liege, Belgium, May 1999. 18. Vitorino Ramos, Pedro Pina, Michele Mengucci, Fernando Muge, Classifying Iberian Ornamental Stone Images trough Genetic Algorithms and Mathematical Morphology, SIARP´99 – IV beroAmerican Symposium on Pattern Recognition, J.R.Shulcloper, J.F.M.Trinidad, G.S.Díaz et al Eds., ISBN970-18-2386-9, pp. 389-398, La Habana, Cuba, March 1999. 17. R.Bruno, S.Persi Paoli, P.Laurenge, C.Corsi, M.Coluccino, F.Muge, V.Ramos, P.Pina, L.Sottomayor, M.Chica Olmo, E.Serrano Olmedo, J.Quereda, Characterization and Classification of Ornamental Stones by Image Analysis, EUROTHEN´99: Proceedings of the Second Annual Workshop, Paspaliaris, Taxiarchou, Adjemin & Katagalarianakis (Eds. ), Lab. of Met., NTUA, Athens, Greece, EUR 18915, pp. 335-351, 12-14 Jan. 1999. 16. R. Bruno, I. Bedeschi, C. Lamberti, F. Brancaleoni, M. Proverbio, O. Corbelli, F. Muge, P. Pina, V.Ramos, L. Sottomayor, F. Travassos, M. Chica-Olmo, E. Serrano, J. Quereda, G. Sanchez; Image Analysis on Ornamental Stones – COSS, in 25th BCR-Anniversary Conference (Measurements – a key to competitiveness), European Commission, Brussels, 3-4 November 1998. 15. M.Chica-Olmo, R.Bruno, F.Muge, E.Serrano, J.M.Quereda, G.Sánchez, P.Pina, V.Ramos, L.Sottomayor, S.Persi Paoli, C.Lamberti, M.Proverbio, C.Briganti; Caracterización de Estándares de Rocas Ornamentales mediante Análisis de Imagen de Superficie del Producto Final (COSS); II Congreso Intern. de la Piedra, Madrid, 5-6 Maio 1998 (also in CD-ROM). 14. Pedro Pina, Vitorino Ramos, Fernando Muge; Feature Extraction from Portuguese Granites for Classification purposes, Proc. RecPad´98 – 10th Portuguese Conference on Pattern Recognition, F.Muge, C.Pinto and M.Piedade Eds., ISBN 972-97711-0-3, pp. 265-272, Lisbon, March 1998 (also in CD-ROM). 12. Vitorino Ramos, Fernando Muge; Optimisation Génétique de la phase d’apprentissage en Réseaux de Neurones pour la Reconnaissance de l’écrit, CIFED´98 – 1er Colloque Internacional Francophone sur l’écrit et le Document, 66 Congrés ACFAS – Les Cahiers Scientifiques nº 93, R.Plamondon et R.Sabourin (Eds. ), ISBN 2-89245-148-5, pp. 275-285, Québec, Canada, 11-13 Mai 1998. 11. R.Bruno, S.Persi Paoli, C.Lamberti, M.Proverbio, C.Briganti, F.Muge, P.Pina, V.Ramos, L.Sottomayor, M. Chica-Olmo, E.Serrano, J.Quereda, G.Sanchez; Characterization and Classification of Ornamental Stones by Image Analysis, 1st EUROTHEN Workshop, A.Kontopoulos, I.Paspaliaris, A.Adgemian and G.Katalagarianakis (Eds. ), EUR 18310, Vol. 2, pp. 359-373, Athens, Greece, 12-14 Jan. 1998. 10. Vitorino Ramos; Evolução e Cognição em Análise de Imagem; Dissertação apresentada ao Mestrado em Geo-Recursos, 230 pp., Instituto Superior Técnico (Bib. Central IST: ref. x-71-02001-2), Lisboa, Dez. 1997. 9. R. Bruno, I. Bedeschi, C. Lamberti, F. Brancaleoni, M. Proverbio, O. Corbelli, F. Muge, P. Pina, V.Ramos, L. Sottomayor, F. Travassos, M. Chica-Olmo, E. Serrano, J. Quereda, G. Sanchez. ; Characterization and Classification of Ornamental Stones by Image Analysis, IAMG´97, Barcelona, Set. 1997. 8. F. Muge, P. Pina, V. Ramos, L. Sottomayor, R. Bruno, I. Bedeschi, M. Mengucci, C. Lamberti, F. Brancaleoni, M. Proverbio, O. Corbelli, M. Chica-Olmo, E. Serrano, J.M. Quereda & G. Sanchez; Characterization of Ornamental Stones Standards by Image Analysis of Slab Surface (COSS), Eurominerals´97, II International Congress of Natural and Industrial Stones, Lisboa, 4-6 June 1997. 7. Vitorino Ramos; Using Principal Component Analysis and Genetic Algorithms techniques to Optimise learning time on Neural Network training for Pattern Recognition, Proc. RecPad´97, 9th Portuguese Conference on Pattern Recognition, L.V.Sá and H.Araújo (Eds. ), ISBN 972-96889-1-5, pp. 153-160, Coimbra, 20-21 March 1997. 6. Leopoldo Cortez, Fernando Durão, Vitorino Ramos; Testing some Connectionist approaches for Thematic Mapping of Rural areas, Neurocomputation in Remote Sensing Data Analysis, I. Kanellopoulos, G.Wilkinson, F.Roli, J.Austin (Eds. ), ISBN 3-540-63316-2, pp.142-150, Springer-Verlag, Univ. of York, York, UK, 1996. 5. Vitorino Ramos; Applications of Neural Networks in Structural Mechanics, DEA Thesis on Computational Structural Mechanics, Pierre et Marie Curie University – Paris VI, Option VI – V. Braibant (SAMTECH France / Paris VI), Paris, June 1994. 4. Vitorino Ramos; Image Analysis on the characterization of Cellular Materials; Cork as an example, RecPad´93, 5th Portuguese Conference on Pattern Recognition, A. Jorge Padilha Eds., ISBN 972-95883-0-9, pp. 306-308, Porto, 13-14 May 1993. 3. Manuel Amaral Fortes, Vitorino Ramos, Aldina Soares; Grain growth in one dimension: the Mean field Approach, Materials Science Forum, Vol. 94-96, pp. 337-344, Trans Tech. Publications, Switzerland, 1992. 2. Vitorino Ramos; Análise de Imagem na Caracterização de Materiais Celulares: a Cortiça como exemplo, trabalho final de Curso de Engenharia de Materiais, IST, Lisboa, 1992. 1. M. Amaral Fortes; V. Ramos; Cell’s systems Evolution; Foams, Polycristals, Biological substances, and successively fragmentaded Solids, Proc. 6th National Conference of Physics – Physics 88, in Aveiro, Sept. 1988.